Ahh, the charming simplicity of a burger! I can’t say that burgers were the one type of food that I’ve missed the most since going vegan. After all, vegan burger recipes are never in short supply on the internet. The variety is so large that you can pick from simple recipes to some rather complicated ones that’ll send you searching for exotic ingredients at your local ethnic markets. I’ve tried lots of homemade burger recipes, and while some of them turned out better than others, the one thing that I almost always found lacking was texture. As a former meat eater, I was used to biting into a firmer, chewier burger. Most veggie versions couldn’t deliver that, and while I have no intention to harm any cows for a burger’s sake again, I thought that it would be nice to find a burger with a texture similar to meat. 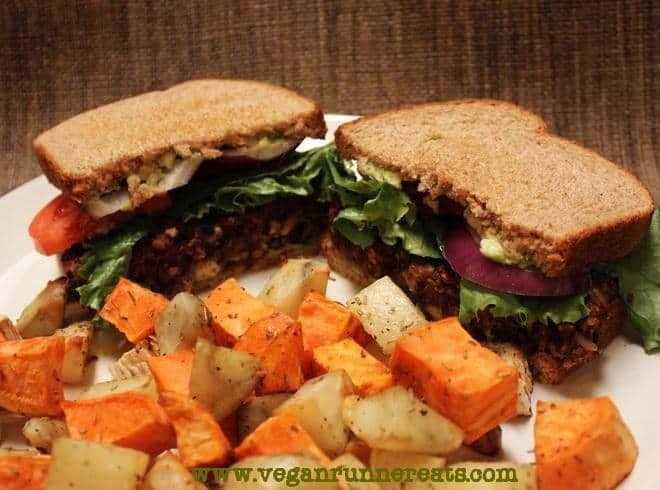 Lo and behold – the Black Bean & Tempeh Burger! Okay, I know that it’s hard to impress any vegan person with a black bean burger these days… but hear me out: this burger gets its chewy, absolutely not mushy texture from a combination of black beans, brown rice, and shredded tempeh! This isn’t one of those black bean patties that require you pulsing the burger mixture in a food processor, and then waiting in vain until the patties firm up during cooking! And while I was so focused on achieving the right texture, I didn’t even notice that these burgers even look like they’re made of meat! I didn’t have any fancy burger buns at home when I made these, so I settled with some whole wheat toast. That turned out to be a good idea: the patties were so filling (especially with a side of herbed roasted potatoes) that big buns might have been too much. To complete the sandwich, I used the classic burger toppings such as lettuce, tomatoes, red onions and avocado. They worked very well with these patties, but if you’re feeling adventurous, you can experiment with any other toppings! A fairly simple veggie burger recipe that doesn't call for lots of exotic ingredients. no food processor required! In a heated large frying pan, sautee onions, garlic and squash/zucchini for 5 min, adding 1-2 Tbsp of water to prevent sticking. Mix in the rinsed black beans and all of the seasonings except salt. Let the beans get warm, about 2 min, then take the pan off the heat. Put one half of the bean-zucchini mixture into a small bowl and roughly mash with a potato masher. It doesn't have to get completely mashed, just broken down a little. Avoid using a food processor as it might overdo the mashing. In a large bowl, combine cooked brown rice, grated tempeh, bean mixture (both mashed and unmashed parts), tomato paste, sprinkle with salt to taste. Mix until well combined, taste and add more salt or any of the seasonings if needed. Let stand for at least 5 min before you form the mixture into patties. Heat the same frying pan you were using earlier to cook the bean-zucchini mixture (if it got dirty, wipe it with a paper towel or quickly rinse). Form your burger mixture into 4-6 patties (I made 4 large ones). Lightly spray the pan with cooking spray and add your patties. Cook over medium heat for 3-4 min per side, or until the patties get browned to your liking. These patties might be good for grilling instead of pan-frying, but I haven't tried that. If you decide to grill them, I suggest that you put raw patties on a piece of aluminum foil first to prevent them from sticking to your grill, and then finish grilling over open fire once they harden on the surface. Have you tried other vegan burger recipes? Which types of patties do you like the most? Loved this recipe? Share it with your friends! And stick around for more awesomeness – you can follow Vegan Runner Eats by subscribing in the top right corner of this page, or by following the blog on Facebook, Twitter, Google+ and Instagram! 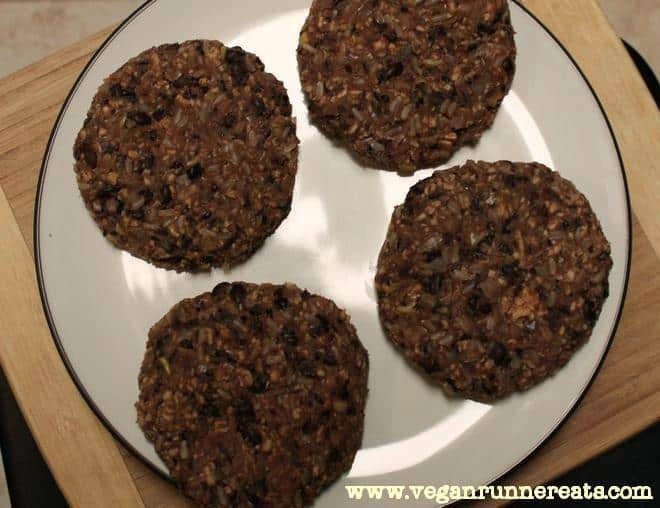 Tagged black beans, brown rice, burgers, oil-free recipe, tempeh, whole food plant based diet. Bookmark the permalink. Do you add the tomato paste in step 1? I made them and they were delicious, but they were still mushy like most veggie burgers I’ve made. Oops: forgot to say that tomato paste should be added in step 3 – thank you for pointing this out, Lindsey! Glad you liked these burgers! As for the texture, maybe we should add more rice next time to make them firmer (adjusting the seasoning), or cook them longer to make them less mushy. Made these last night and they did not hold together but tasted great — also think a lot of the seasonings ended up stuck to the bottom of the skillet. I think different types of rice and different preferences for how soft it is when finished cooking will affect burger texture. I tend to make mine cooked but firm and dry. I did not have a potato masher so used a slotted spoon to mash – maybe I didn’t mash enough? When I make again, I think I will reserve some bean juice in case I need more binding capability when I form the patties. Thanks for the inspiration on adding tempeh to my veg burgers! I thought the texture was wonderful. Hi Chris, thank you for letting me know! I haven’t made these in a while, should probably revisit this recipe and tweak it to get the burgers to hold together better.